I love this new set. 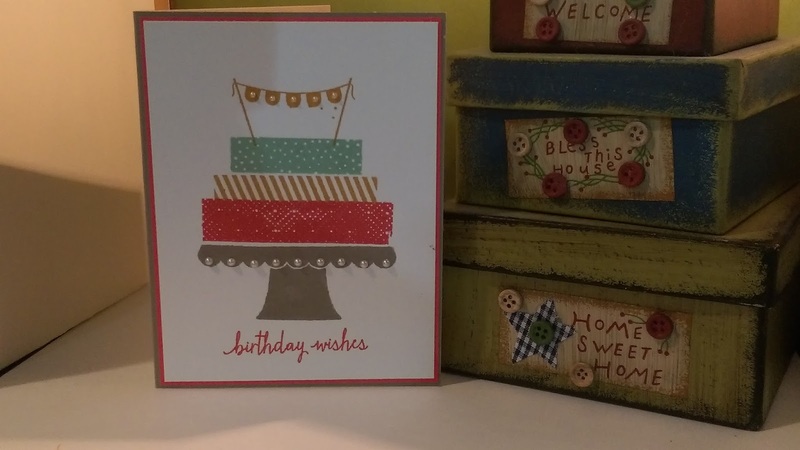 It offers so much versatility because you can create the layered cake with the stamps, you can mix in Washi tape for the layers or DSP. You can also make candles out of the "layer" stamps because a flame is included in the stamp set. Just let your imagination run with this set and see just what you can create yourself. Here I used all of the layer stamps and some of the new In-colors, Watermelon Wonder, Delightful Dijon, Mint Macaron, and Tip Top Taupe........I love these colors! And I added some pearls to the banner flags and the ruffled edge of the cake plate. So, what do you think? 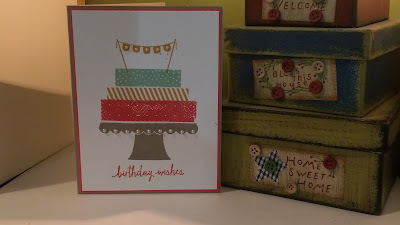 I used Tip Top Taupe for the card base 8 1/2"x5 1/2" scored at 4 1/4" and layered the Whisper White piece (5" x 3 3/4") Watermelon Wonder 5 1/4" x 4". Did you get crafty this weekend? Now that you have had time to look at the catalog, which new stamp set is your favorite?